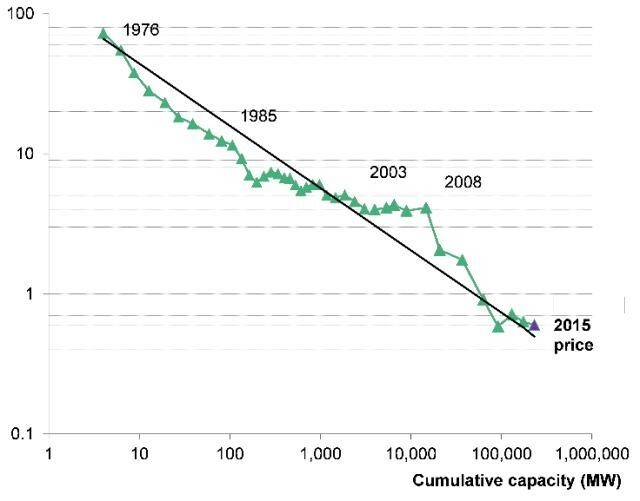 The price of solar power has fallen dramatically in the past four decades. This wonderful development has empowered individuals to install solar panels in their homes and produce their own energy. Individuals with home solar have become more independent and can avoid potential increases in electricity bills from utilities. Moreover, it allows homeowners to better control and reduces their greenhouse gas footprint. The cost of batteries is also falling, driven by economies of scale and technology improvements for rechargeable lithium-ion batteries. These are now used in everything, including our laptops and smartphones. With a large bank of batteries, homeowners can also store excess electricity generated by their solar panels during the day and draw from the batteries during the night. In the future, wide deployment of electric cars can also add battery capacity to our homes. All this enables individuals to use more of their own solar electricity and less from the grid. There are, however, seasonal variations in the supply of wind and solar energy. For example, in winter months, there’s very little sunlight even in the daytime. The sky can be blocked by clouds and solar panels covered by snow. These subpar conditions can last for months. There is no battery technology today that can economically store enough electricity for weeks of blackouts, let alone months. Most homeowners with solar panels still need to tap into the electricity grid, since the sun’s light is not available 24/7 and batteries have finite capacities. Full independence from the grid is still very hard to achieve. Utilities are pushing back too. Many utilities advocate that everyone must share financial responsibility for the maintenance and upgrade of the centralized power and electrical grid infrastructure, even for homes who have self-production capacity. Some are implementing an access charge for users who have on-site generation if they still need to tap into the grid. But are there new technologies that can disrupt this picture? Over the past century, more than 80% of electricity on Earth has been generated in central power plants and this is still true today. These power plants are huge with some providing power for around a million homes. But a single power plant can cost billions of dollars. They burn coal, natural gas, oil or nuclear fuel to generate heat which runs a mechanical turbine and alternator to induce electricity. That electrical power needs to be distributed across hundreds of miles to the end user, requiring expensive transmission infrastructure and causing losses to efficiency. In addition, power plants which use fossil fuels contribute to climate change. These traditional power plants do have one critical advantage though. Unlike new renewables, they can produce power at all times and this ability to produce on-demand electricity can complement solar-powered plants. Individuals who wish to be independent from the grid will need a complement to their home solar panels too. So, is it possible to scale down a power plant to the size of a home? As it turns out, most homes already have half of a miniaturized power plant. Electricity is just a part of our daily energy consumption – we also need heat to keep us warm. We need thermal energy to heat our homes, hot water and food. And so, in the US, more than 60 million homes are heated by natural gas and there are 100 million gas boilers installed in European homes. Now, technologies are becoming available to complete the rest of the miniaturized power plant. This is called micro-combined heat and power (CHP). Micro-CHP generates both electricity and heat simultaneously at the size of a home. The heat meets the demand for space heating and hot water, while the electricity provides power for home appliances. How does it work? Let’s first look at the current status quo. Right now, your boiler burns natural gas at incredibly high temperatures approaching 2,000°C. However, you only need hot water and space heating at ~50°C. At the moment, a gas boiler just lets the heat degrade and cool down, throwing away most of the useful energy content. In comparison, in micro-CHP, that huge temperature difference is used to generate electricity in addition to heat. Micro-CHP can attain overall efficiencies of 90% by generating both electricity and heat on demand and at the location where both are needed and valuable. This contrasts with central power plants, which produce electricity at 35% efficiency. At these plants, the waste heat is usually thrown away, since the heat can’t be transported hundreds of miles to where it is needed. The higher efficiency of micro-CHP can help cut homeowners’ energy bills by 30% and reduces their carbon footprint. Some micro-CHP technologies use mechanical engines, such as internal combustion engines or Stirling engines. They reach good efficiencies only at larger sizes, so are more suitable for large apartment complexes or commercial buildings. Today, newer technologies such as fuel cells and thermionic energy converters can reach high efficiencies even at the scale of a single home. This allows micro-CHP to be available to individual consumers and homeowners. Furthermore, these new technologies have no moving parts and thus have far lower maintenance requirements and no sound pollution making them more amenable to a residence. Finally, this set-up gives individuals the option of producing power on demand, thus complementing home solar power and storage. The benefits of a system of solar, batteries and efficient small generators go beyond being greener and saving energy bills. One recent sad example remains unresolved. A month after Hurricane Maria hit Puerto Rico; a US territory with 3.4 million people, 80% of the island still has no electricity. This tragedy shows the fragility of traditional centralized power generation and transmission. The future can be different. By keeping power sources close to the end user, power is less likely to disappear when a tree falls on a power line. Solar, batteries and small generators can form a microgrid that improves the resilience of our energy systems. Being able to go small really matters. Together, these technologies enable distributed generation, even at the level of individual homes. This can be critical for the developing world, where billions of people still don’t have access to reliable power. With these technologies, society can leapfrog the need to spend trillions of dollars on infrastructure for central power generation and transmission. This can help us to deliver power to all people faster.